Upon my arrival to the Roma Termini, I was thrown into the craziness of the city. The energy of the city was amazing and that's a lot to say coming from the city of Chicago. After exiting the terminal I made my way to my Airbnb which was located only 2-3 blocks from the Roma Termini. This convenience really paid off in the end especially when I traveled to southern Italy and then traveled late back north - more on that in a minute. If you'd like to check out my Airbnb that I stayed at please visit it here. In no way am I sponsoring Airbnb or this specific Airbnb, but I would love to give a huge shout as my stay was absolutely wonderful and it was unbelievably convenient. If I can recommend anything first and foremost before traveling to Rome it's to always pre-purchase tickets if you can go places. For example my tickets to the Vatican which included a private tour along with my tickets to see the Colosseum. The lines to these two places without would take you hours at a time which for most travelers we do not have endless amounts of time to do. So make sure to purchase tickets prior and if you can book some tours as well - believe me, I thought I would be able to just do it on my own, but the tours truly help you see lots of great things in a short amount of time. Plus, you always meet some new friends along the way. After your tours, you can always mosey about if you desire at your own pace which is the best part and now you know where so many things are located! The Colosseum was quite unbelievable in person! I recommend grabbing a lunch before to go and bringing it with so you can find a spot outside of the Colosseum and admire it from afar. I sat for a good hour just taking in this magnificent structure. Make sure to mosey about some of the sidewinding walkways too as they have some of the best hidden secret spots for photos! Another wonderful destination is Vatican City. I thought that I would spend an entire day here from what I read by others, but it ended up being about four hours only. I visited on a Wednesday which I discovered was the day that the Pope actually gave a speech in front of St. Peters Basilica. I missed out, unfortunately, but if you ever want to see the Pope make sure to plan to see him every Wednesday! I did, however, take a quick taxi after my museum tour to see St. Peters Basilica and it's gorgeous. Vatican City was much larger than I expected - literally it's a mini country in itself so I actually found myself taking taxis more often here. I took a guided tour which lasted about two hours and it was well worth it like I stated previously. I saw magnificent art-pieces such as The School of Athens by Raphael and of course the well-known Last Judgement in the Sistine Chapel by Michelangelo. There are endless upon endless amounts of things to see - however, after a while, I felt like I needed to continue on and see what else Rome had to offer. I visited many other museums throughout the city all which housed many great pieces so I recommend attempting to visit as many as possible. One of the things that I didn't realize traveling to Rome was how incredibly spread many of the well-known art pieces that you may have seen or learned about truly are. I was under the impression that many of the pieces were housed at the Vatican or other large museums - this is not the case. Many of the art-pieces are scattered throughout the entire city and are housed in small churches. For example, the Calling of Saint Matthew by Caravaggio is housed in a small church called the San Luigi dei Francesi and the amazing statue the Ecstasy of Saint Theresa is housed in another small church called the Santa Maria della Vittoria. Both of these churches are far apart so mapping such places out will be very useful during your trip - so make sure to do your research! Some of the other great sites to visit are the Trevi Fountain and the Pantheon. A major heads up when visiting the Trevi Fountain is that it's extremely crowded to the point that it's nearly impossible to get through the crowd. It was probably the most tightly populated area that I experienced while in Rome. Try to head there early in the morning or late in the evening when the crowds have dissipated a bit - and don't forget to grab a gelato at one of the many gelato cafes nearby. It's quite a moment to be had! The Pantheon was jaw-dropping beautiful and I moseyed over right after I visited the Trevi Fountain. The Pantheon is probably one of the most incredible structures I've ever seen in my life. The color of the stone and the feeling of the entire place is just surreal. To think that these places were built so long ago without the modern machinery we have today is really incredible. After 2 days in Rome, I took an early morning train south to Naples and transferred trains to Pompeii. There are no direct trains to Pompeii so you must transfer once arriving in Naples and take an hour train ride to the city. The train ride to Naples and then to Pompeii is unbelievable. If you have time to stop off in some of the connecting towns I recommend doing so - just keep in mind you will need to plan accordingly. These smaller towns are where you will find some outstanding food as well as meeting some amazing people - not to mention having some great opportunities for amazing photos! After arriving in Pompeii you can either walk or take a quick taxi ride over to the Pompeii ruins called Scavi de Pompeii. I can't stress enough as I previously stated to pre-purchase your admission tickets prior to your trip to these ruins. The lines to enter are incredibly long so pre-purchasing was a quick walk-up to the counter for admission. You can then either find a group to join for a tour depending on what language you prefer - which I did not do this time -, but instead I decided to go on my own with an English speaking audio guide that I rented at the entrance and could carry around with me. This was actually pretty great and allowed me to enjoy everything at my own pace. I will say however the ruins are vast and it's very exhausting so make sure to wear comfortable clothing and very comfortable hiking shoes as the ruins are very uneven at times and there is nothing to block you from the sun. The ruins were absolutely incredible though! Probably one of the most amazing places I've been to where you truly can grasp how these people lived thousands of years ago - discovering that their lifestyles were actually quite modern in many ways. The backdrop of Mt. Vesuvius while walking the ruins is just beautiful. If I can make one major recommendation it's to visit some of the hidden gardens in the ruins. No one really goes to them and they're seriously the most extraordinary places to grab lunch and just sit back and relax for a little while! My entire time at the ruins was about four hours - again I expected it to be an all-day trip, but it was much shorter than I expected so I decided to make a trip to Amalfi with the rest of the daylight I had left. From Pompeii, I then took a quick train ride to the city of Salerno. Salerno itself is an incredible little city housed on the coast of the Tyrrhenian Sea where literally the mountains dive straight into the sea and cities are built into the mountainsides. It's truly a sight to see. After walking a bit in Salerno I came across a boat that made frequent trips to and from Amalfi. Winging this last part of my trip I paid a few euros only and took the thirty-minute boat ride over to the town of Amalfi. The boat ride you guys was everything! This was hands down my favorite part of my Italy trip. No words can describe the beauty you will encounter, but I hope my photos give it just a little bit of justice. Once in Amalfi, I recommend stopping and grabbing another gelato (you see a pattern here with me and my gelato runs haha!) and walking into the city. The streets are carved into the mountains along with all the shops so with the lack of better words to describe this it's mind-blowing and incredible to experience so get ready! Make sure to snag some locally made limoncello which the coastline is known for producing at one of the many stores in the city! It's great for making some wicked good cocktails when you return back home. 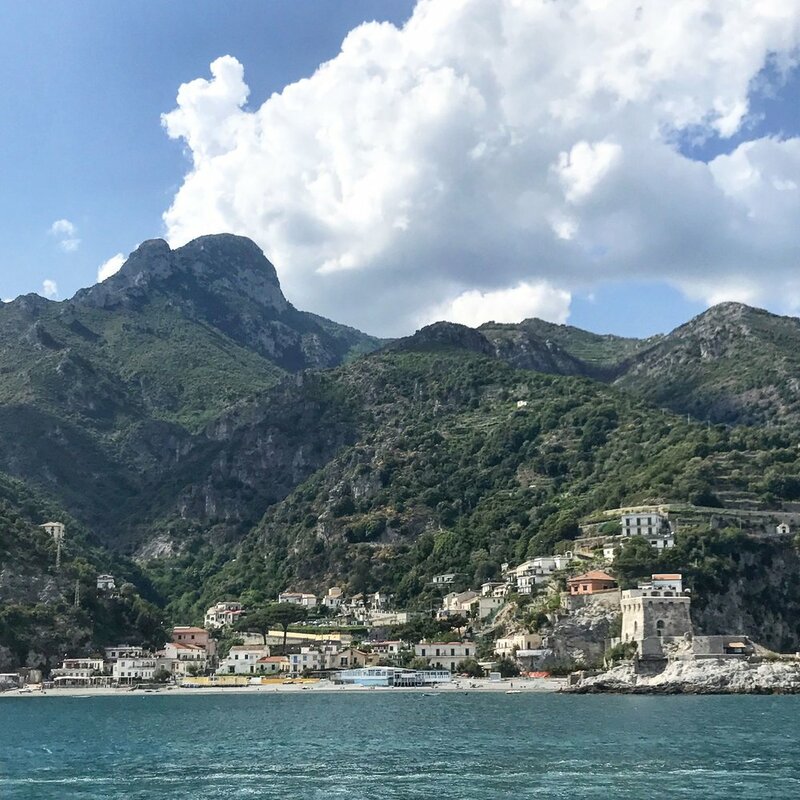 After a few hours in Amalfi, I then took the boat back to Salerno and then took a train ride back to Naples and then to Rome. The entire trip was about two and a half hours long so I arrived pretty late back in Rome, but it was completely worth it! Sunburn and all. I hope you enjoyed reading about my trip and if you're planning to head to any of these amazing places in Italy I wish you the best of journeys! I would love to hear from you as always so please reach out!